Rochdale is a constituency in Greater Manchester. The seat was created in 1950. The current member of parliament is the Labour Party’s Simon Danczuk who has represented the constituents since 2010. 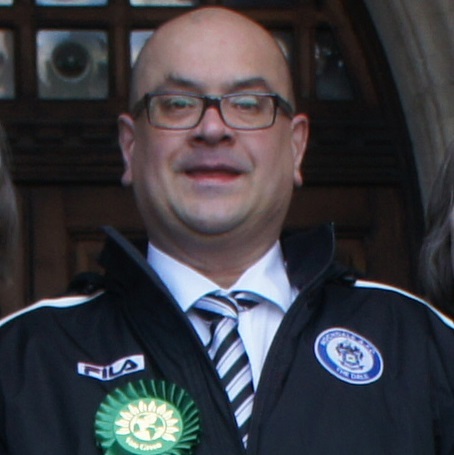 Mark is the Green Party candidate for Rochdale constituency, and is also standing in Kingsway Ward in the local elections. Mark was born in Rochdale and has lived here all of his life. He lives in Turf Hill with his family so he knows the area well, cares for the area, and is keen to see the area improved. For 40 years been a supporter of Rochdale A.F.C. Mark is a Trade Unionist, active in the Unite and PCS Trade Unions. Mark says; “I am a Green Socialist. I believe in policies that benefit the vast majority of the population; scrapping billions of pounds wasted on nuclear weapons and instead investing in health, education, care for the elderly and a strong public sector. I support the policies of the Green Party; policies that have been ditched by other political parties, as they try to appease the rich and powerful of this country including the media.